NFP is an umbrella term for certain methods wherein the couple observes the naturally occurring signs of fertile and infertile phases of a woman’s menstrual cycle for the purposes of either achieving or postponing pregnancy. It is a comprehensive acceptance of the divine gift of fertility within marriage. NFP reflects the dignity of the human person within the context of marriage and family life, promotes openness to life, and recognizes the value of every child. 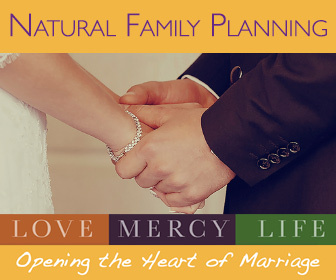 By respecting the love-giving and life-giving natures of marriage, NFP enriches the bond between husband and wife. To register please contact Maria at the parish office: (903) 675-2509. Deadline to register is December 10th. This class will meet 3 times, each session lasting about 2 hours each and are spaced one month apart to give you and your fiance/spouse a chance to practice what you've learned. Click here to Register Online! Check back for updates to the diocesan NFP class schedule! There are a variety of online classes available, depending on the method you are looking for! Click the images below to connect to online class options for each of the methods listed. Teaching Couple? Contact the Family Life Office!